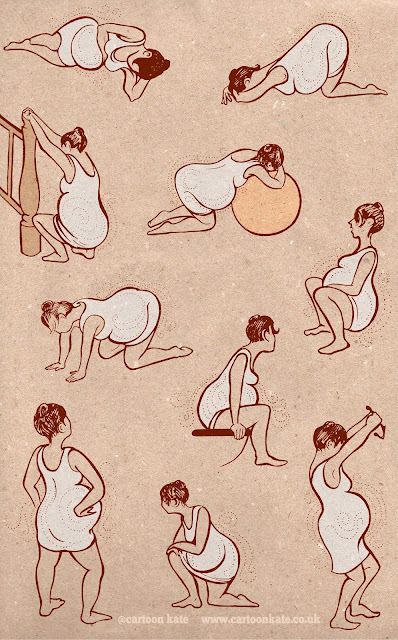 If you’ve already seen the beautiful positions for labour artwork by the amazing Kate Evans that feature in the Positive Birth Book, you’ll be pleased to know that our collaboration goes much further! I’ve been in love with Kate’s art and imaginative flair ever since I read her amazing book Bump, so I nearly passed out with excitement when publishers Pinter and Martin agreed to commission her not just to do these amazing illustrations, but to collaborate with me on a much bigger part of the book – the Visual Birth Plan, or VBP. I’ve loved the idea of a Visual Birth Plan ever since I saw birth plans made from little icons floating around on social media a couple of years ago. These little icons are pretty simple and basic, wouldn’t it be better if the icons were more suited to every birth choice, and more beautiful, I thought?! I know there are arguments to be made about birth plans ‘per se’, and I’m not going to go into those here – suffice to say, I think they are a widely misunderstood tool that can really help both women (and their midwives) get real clarity of the kind of birth they want, and think through ALL the possibilities too – ie make not just a Plan A for their ideal birth, but B, C and D as well. In the Positive Birth Book, a huge 52 page section (subtitled Being Birthzilla – ha!) takes you through the total maze of choices you face as a pregnant woman, helping you to work out exactly what you want in every eventuality. Woven through the section are the Icons for the Visual Birth Plan, all uniquely designed especially for the book by Kate. The book contains a link (which I’ll keep secret for now) where you can download the icons and use them to build your own completely beautiful VBP. You can then share this plan with your care providers (in tandem with a ‘longhand’ / more conventional written plan if you like), and convey all of your wishes to them, clearly and at a glance.